Ashwaghanda may be for gymrats, too. Ashwaganda is one of the supplements that has been around forever. While this would suggest that it works, the relatively low number of people who actually use it suggests otherwise and scientific evidence in form of peer-reviewed, non-sponsored studies that would allow us to draw a reliable conclusion with regard to its usefulness for athletes is rare... Well, actually there are only four studies on Withania somnifera, which is also known as Indian Ginseng or Winter Cherry, of which you could say that they are at least relevant to the topic - even though none of them was conducted in resistance trained / training individuals. There's a study by Raut, et al. that evaluated the "tolerability, safety, and activity of Ashwagandha (Withania Somnifera) in healthy volunteers" from 2012; a study by Sandhu, et al. 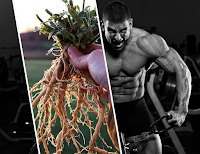 in which the researchers probed the "effects of Withania somnifera (Ashwagandha) and Terminalia arjuna (Arjuna) on physical performance and cardiorespiratory endurance in healthy young adults" and found an increase in velocity [+3%], relative power [+9%] and VO2 max [+7%] in response to 500mg/day for 8 weeks; a study by Choudhary et al. (2015) which found both, increases in VO2max and quality of life of 50 "athletic" individuals in response to a commercial Ashwaghanda product that goes by the cryptic acronym KSM-66 Ashwagandha; as well as a study by Shenoy, et al. (2012) which found 11%, 16% 16% and 2% increases in time to exhaustion, VO2, metabolic equivalents (METs) and respiratory exchange ratio (RER), respectively (note: the benefits were sign. lower in female study participants, see Table 1), in response to the same amount, i.e. 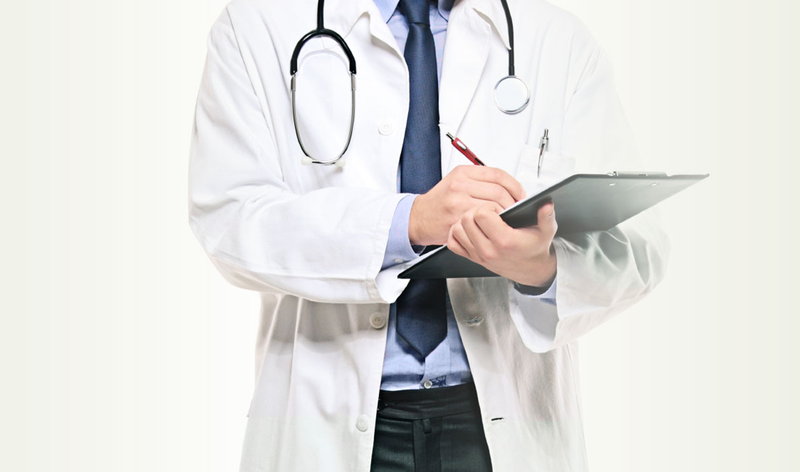 500 mg/day, of an aqueous root extract of Ashwagandha that has been used by Sandhu et al. two years before. Table 1: Mean percentage (%) difference of pre-post readings of forty male and female elite (elite here refers to the participation of the athlete in at least state-level events) Indian cyclists in response to 8 weeks on 500 mg of standardized aqueous root extract, which was obtained in the form of capsules from Dabur India Limited (Sandhu. 2012). in young men who participated in a standardized resistance training regimen, it is thus not totally impossible that the next best Ashwaghanda product from the internet will produce significantly different results. I guess you should keep that in mind if you plan to go shopping after reading this article. The product Wankhede, et al. used, by the way, was provided by Shri Kartikeya Pharma and Ixoreal BioMed and happened to be the same KSM-66 high-concentration root extract Choudhary et al. used in their likewise very recent study. I don't want to waste your precious time with speculations, though. Let's talk about Wankhede's recent study, on 57 men (18-50 years), who were randomly allocated to either the treatment group, in which the subjects consumed 300 mg of ashwagandha root extract twice daily, or the control group, which received identically looking starch placebo capsules. BIA and CK - not the best ways to measure body fat and recovery: What should be noted about these measurements, though, is the fact that body fat levels were measured via bio impedance (BIA) and the recovery was judged based on creatine kinase (CK) values. With BIA being susceptible to variations in hydration status and other sources interference (Kyle. 2004) and the CK-values showing extreme inter-individual variability (learn more), the validity of these outcomes remains somewhat questionable. "The resistance training program consisted of sets of exercises over major muscle groups in both the upper body and the lower body. [...] Each subject in both groups was asked to come to a training session every other day, with one rest day pe week, for three days per week. Every session began with a warm up consisting of five minutes of low-intensity aerobic exercise. The subjects were instructed to perform, for each set as many repetitions as they could until failure. The subjects were asked to go through the full range of motion and were demonstrated the proper technique for safe and effective weight lifting" (Wankhede. 2015). The workouts were periodized with increasing number of sets from 1-2 to 3. More specifically, the subjects performed barbell squats, the leg extensions, seated leg curls, machine chest presses, barbell chest presses, seated machine rows, one-arm dumbbel rows, machine biceps curls, dumbbel biceps curls, cable triceps press-downs, dumbbell shoulder presses, and the straight-arm pull-downs in the first two weeks and barbell squat (3 sets) the leg extension (3 sets), the leg curl (2 sets), one chest exercise (flat, incline or decline press or fly, cable cross over, 3 sets), one back exercise (rows, pull up, pull down or seated cable row, 3 sets), another chest exercise (3 sets) another back exercise (3 sets), one biceps exercise or one triceps exercise (curls or extensions, 3 sets), and one shoulder exercise (raises or presses, 3 sets) for the rest of the 8-week study. 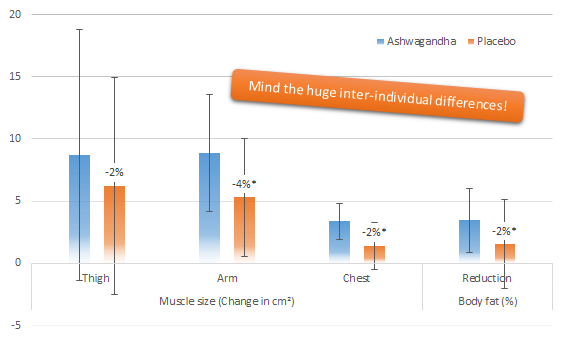 Figure 2: Absolute increases in thigh, arm and chest size and reduction in body fat (%) over the course of the 8-week study; the figures above the bars denote the inter-group difference in %, * denotes significant differences (Wankhede. 2015). Significant inter-group differences were found for almost all of the measured variables: the size increases in the arms and chest, the change in body fat (remember, those are only BIA values), serum testosterone, and CK (remember, this is not a very reliable marker of exercise recovery), as well as the strength increase on the bench press and leg extension machine (1RM, each) differed significantly not just from pre- to post, but also from the supplement to the placebo group (see Figure 2, Figure 3). Figure 3: Changes in 1RM (kg) strength and testosterone (ng/dL) over the course of the 8-week study; the figures above the bars denote the inter-group difference in %, * denotes significant differences (Wankhede. 2015). Sometimes lab values are deceiving - specifically if allegedly pathological elevations of kidney, liver and (heart) muscle enzymes (CK) are nothing but a perfectly physiological reaction to exercise | learn more! So, what's the verdict, then? Yes, this is definitely the most exciting 'Ashwaghanda study', I've seen so far. Next to the limitations Wankhede et al. already discuss in the conclusion of their recently published paper in the Journal of the International Society of Sports Nutrition one should not forget, though, that the methods they chose to determine the body composition and state of recovery of their subjects were appropriate, but not optimal. While the former would have been more reliable if they had used a DXA scan, the latter would actually have to be tested via several post-workout strength tests and auxiliary tests and questionnaires as it was done, for example, by Kraemer et al. (2010). Enough of the complaints, though. 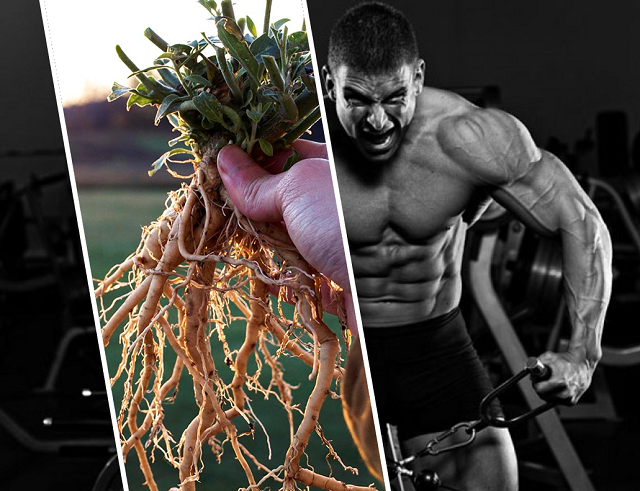 Let's be greatful we even have a study investigating the effects of Ashwagandha on resistance training. 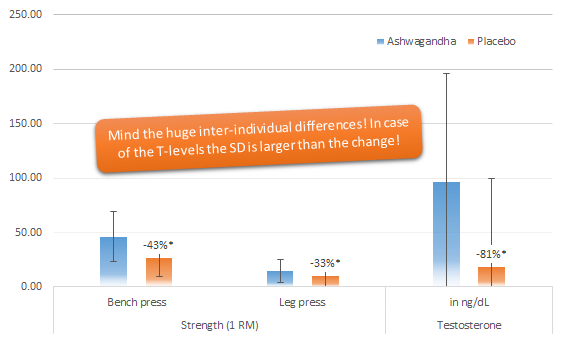 Plus, the increases in strength, muscle size (which would be similarly thwarted by cell swelling in both groups when it was tested 'only' two days after the last workout) and testosterone, alone, warrant the authors' already carefully worded conclusion that "ashwagandha supplementation may be useful in conjunction with a resistance training program" (Wankhede. 2015) - even if the underlying mechanism is still unknown and the hypotheses the authors list in the discussion, i.e. (a) increase in testosterone (too low to have significant effects | learn why), (b) decrease in the levels of cortisol (not measured + acute cortisol elevations are associated w/ lean mass gains in strength training individuals | West. 2012), (c) beneficial effects on mitochondrial health and reduced ATP breakdown (observed only in rodents that were exposed to toxins vs. exercise), and (d) antianxiety effects and promotion of focus and concentration that "may translate to better coordination and recruitment of muscles" (Wankhede. 2015), are as the word "hypothesis" implies only hypothetical, i.e. conjectural | Comment on Facebook! Choudhary, Bakhtiar, A. Shetty, and Deepak G. Langade. 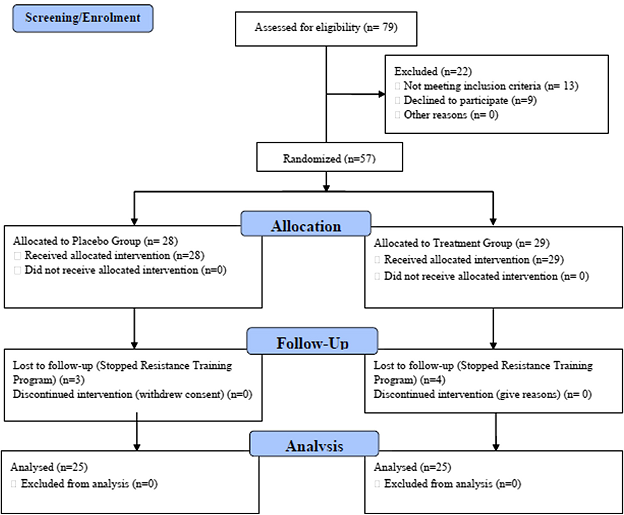 "Efficacy of Ashwagandha (Withania somnifera [L.] Dunal) in improving cardiorespiratory endurance in healthy athletic adults." AYU (An international quarterly journal of research in Ayurveda) 36.1 (2015): 63. Kyle, Ursula G., et al. "Bioelectrical impedance analysis—part II: utilization in clinical practice." Clinical nutrition 23.6 (2004): 1430-1453. Patel, Dhaval, Harisha C. Rudrappa, and Proshanta Majumder. "A comparative pharmacognostical, physicochemical, and heavy metal analysis on Ashwagandha root obtained from natural and polluted sources." International Journal of Green Pharmacy 9.1 (2015): 14. Raut, Ashwinikumar A., et al. "Exploratory study to evaluate tolerability, safety, and activity of Ashwagandha (Withania Somnifera) in healthy volunteers." Journal of Ayurveda and Integrative Medicine 3.3 (2012): 111. Sandhu, Jaspal Singh, et al. "Effects of Withania somnifera (Ashwagandha) and Terminalia arjuna (Arjuna) on physical performance and cardiorespiratory endurance in healthy young adults." International journal of Ayurveda research 1.3 (2010): 144. Shenoy, Shweta, et al. "Effects of eight-week supplementation of Ashwagandha on cardiorespiratory endurance in elite Indian cyclists." Journal of Ayurveda and integrative medicine 3.4 (2012): 209. Wankhede, Sachin, et al. "Examining the effect of Withania somnifera supplementation on muscle strength and recovery: a randomized controlled trial." Journal of the International Society of Sports Nutrition 12.1 (2015): 43. West, Daniel WD, and Stuart M. Phillips. "Associations of exercise-induced hormone profiles and gains in strength and hypertrophy in a large cohort after weight training." 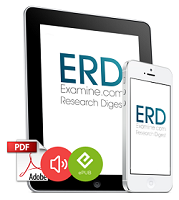 European journal of applied physiology 112.7 (2012): 2693-2702.